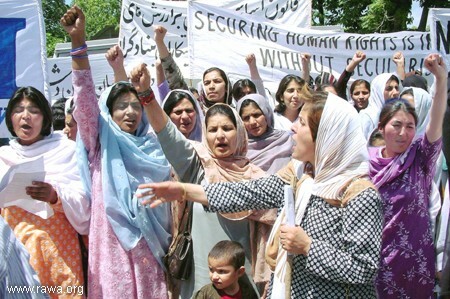 RAWA marks April 28 (seizure of Kabul by the criminal fundamentalists in April 28, 1992) as a Black Day through staging demonstrations in Pakistan every year. 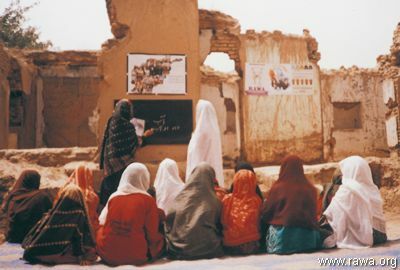 In Afghanistan hardly ten percent of women can read and write. RAWA strongly believes that it is only with the weapon of education that the women of Afghanistan can be empowered and triumph in their struggle against fundamentalists and their ilk. RAWA is administrating hundreds of literacy courses and schools in Afghanistan and Pakistan. If financially enabled, we plan to open more courses throughout Afghanistan. 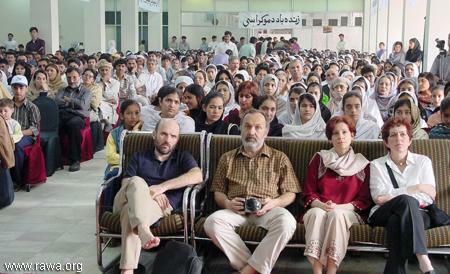 RAWA has a slogan that we would like to see become a reality: "Let's turn Afghanistan into a vast school!" 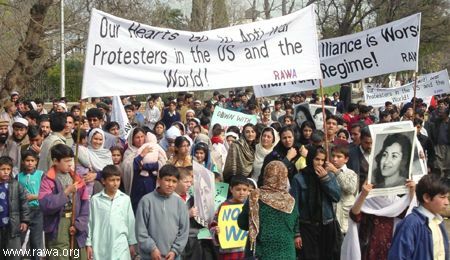 RAWA was the first Afghan organization to hold anti-war demonstration in Islamabad to condemn the war in Iraq. 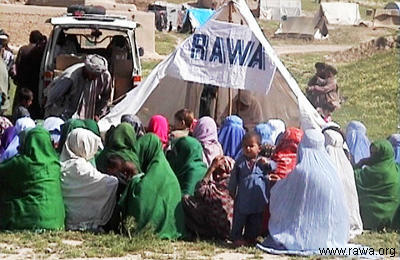 RAWA mobile medical teams visits remote villages to provide help to the needy women and children. 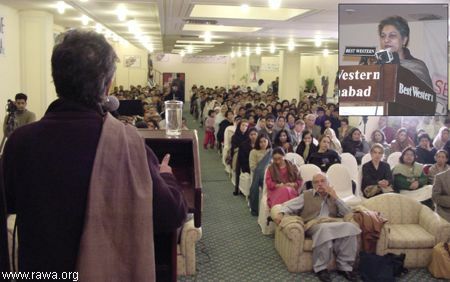 Asma Jahangir, especial reporter of the UN Commission on Human Rights and the most prominent human rights activist of Pakistan delivering speech in a RAWA event to commemorate the 16th martyrdom anniversary of our founding leader Meena. RAWA has stretched its sphere of activity to include taking part in the reconstruction of the country. A large-scale construction project was conducted at the end of 2002 by RAWA members in Farah, a western province of Afghanistan to reconstruct irrigation system. 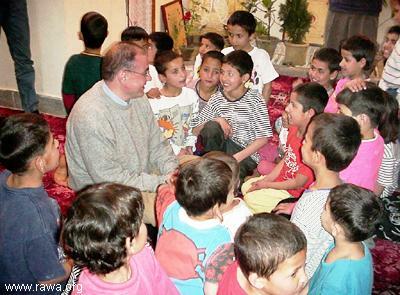 RAWA's orphanages offer safety, shelter, food, clothing, and a better quality of education in many cities in Afghanistan and Pakistan for hundreds of children. 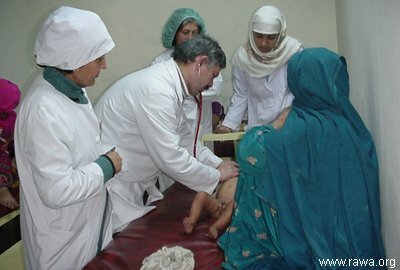 To provide health care to Afghan women and children refugees, RAWA established Malalai Hospital in Pakistan. With 25 beds and 32 staff, it provides free medical care to refugee women and children. Hundreds of women and men attend RAWA events on the International Women's Day every year. Holding such events is an opportunity to raise awareness among women and engage them in actions to fight for their rights. 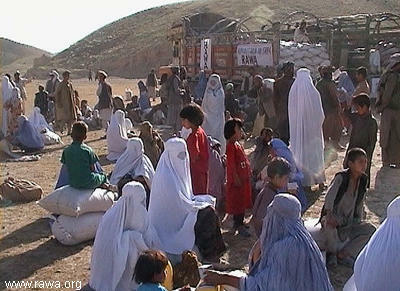 One of RAWA's most important long term projects has been distribution of humanitarian aid in emergency situations in many diverse parts of Afghanistan and Pakistan refugee camps and communities.